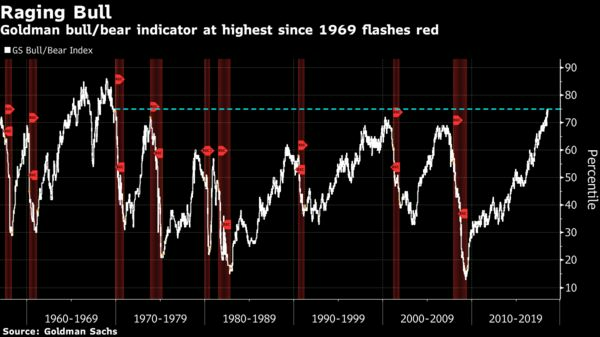 A Goldman Sachs Group Inc. indicator designed to provide a “reasonable signal for future bear-market risk” has risen to the highest in almost 50 years. The firm’s Bull/Bear Index, which is based on measures of equity valuation, growth momentum, unemployment, inflation and the yield curve, is now at levels last seen in 1969. While the gauge is at levels that have historically preceded a bear market, Goldman strategists including Peter Oppenheimer wrote in a note last week that a long period of relatively low returns from stocks is a more likely alternative.